The small village of Addington, to the east of Maidstone is very close to the M20 motorway and is the site of the famous Addington Long Barrow, a Neolithic chamber tomb. The parish church of St Margaret contains an interesting collection of brasses dating from c1378 to c1470 in the chapel to the south of the chancel. 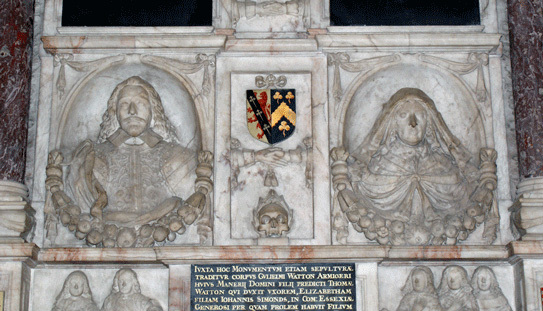 However, the real gem is a large wall monument of alabaster, touch and marble to William and Elizabeth Watton that was erected in 1651 but actually commemorates Watton family members from 1527 to 1703. The monument blocks the original east window of the chapel, a feature visible from the outside of the church. The monument is unsigned but can be stylistically attributed to Joshua Marshall. In the centre of the monument are two ovals containing portrait busts of William Watton and his wife Elizabeth (nee Simmonds). 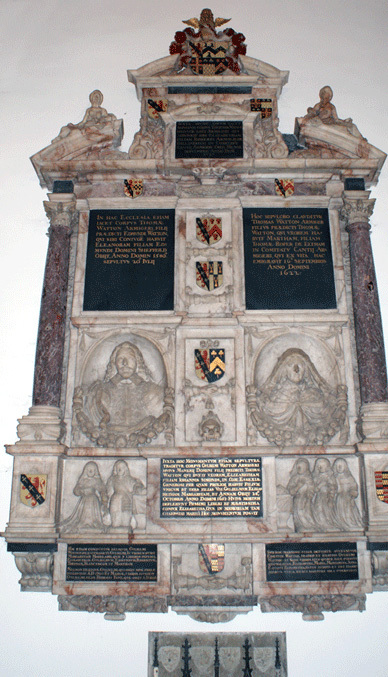 Beneath them are panels of their children; that on the left showing their son William and his wife Margaret kneeling and holding hands. He wears half-armour, with his left hand on an open book on a table, while his right hand is clasped in his wife’s left hand. On the right is a panel showing William and Elizabeth’s three daughters, again kneeling. The first two with their right hands brought to the chests while the third daughter has her right arm linked with the left arm of the sister in front. This last girl is bare headed and wearing a tiny necklace while the other two have veils and no jewellery. Both of the main portrait busts are both shown forward facing. He wears armour, is bare headed and with long hair. A plain collar is seen at his neck and he has articulated shoulder guards and an elaborate engraved breast plate. Elizabeth Watton, to whom the monument was actually erected, has her head covered by a veil which falls to her shoulders and with small wisps of hair showing at the sides.She also has a shawl over her shoulders that is tied in front. Each panel has small drapes looped in the upper corners while the bottom half of each oval is decorated with heavy swags that are tied at the sides. On the outsides of the composition are two composite columns that stand on small projecting supports that have (re)painted shields on front. 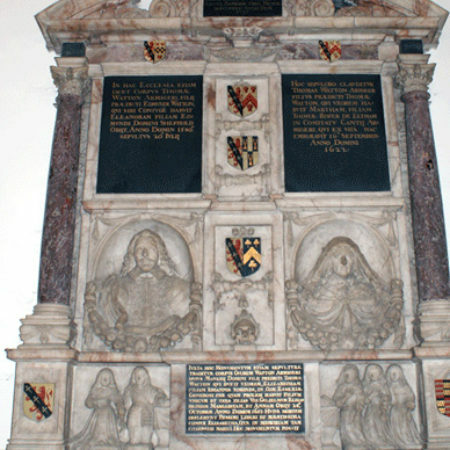 The short bulbous pedestals are decorated with thin bands of drapery that are tied at the front, a feature seen on the monument to Thomas Wilson and wife 1656 at Willian, Herts attributed to Edward Marshall. The columns support an entablature that carries an open segmental pediment on which recline two semi naked female figures while in the centre is a secondary canopy structure, again with an open segmental pediment that has an achievement of arms in the centre and the first of the inscription tablets on the front. One of the unusual features of this monument is the clear division between the left and right halves of the design from the cornice down. The two large inscription panels have a divider between them showing two shields of arms and two pairs of outstretched clasped hands. This is repeated on the panel between the busts – one shield of arms, one pair of clasped hands and a wreathed skull. Finally, between the two lowest inscription panels is another repeat of the divider, another single shield and pair of clasped hands. The clasped hands are intended as a symbol of union between the Watton and Simmonds families and, being shown above a skull, clearly signifying eternal union – one that death cannot separate. The attribution to the Marshall’s and Joshua in particular is based on a number of key indicators. The whole style of the monument, the choice of materials, the rendering of the busts and the children all point to it being a Marshall product. Perhaps the most telling reference to the Watton monument being from the Marshall’s yard is in the depiction of Elizabeth Watton. The distinctive style of her bust, with a veil over her head and the shawl worn over the shoulders and knotted or tied in front, is seen on a number of monuments that have been attributed to Edward and Joshua Marshall. The most well known of these are the monuments at St Margaret Westminster, to Mary Brocas who died in 1654 and at Connington Cambridge to Dame Alice Cotton died 1657 by Joshua Marshall. 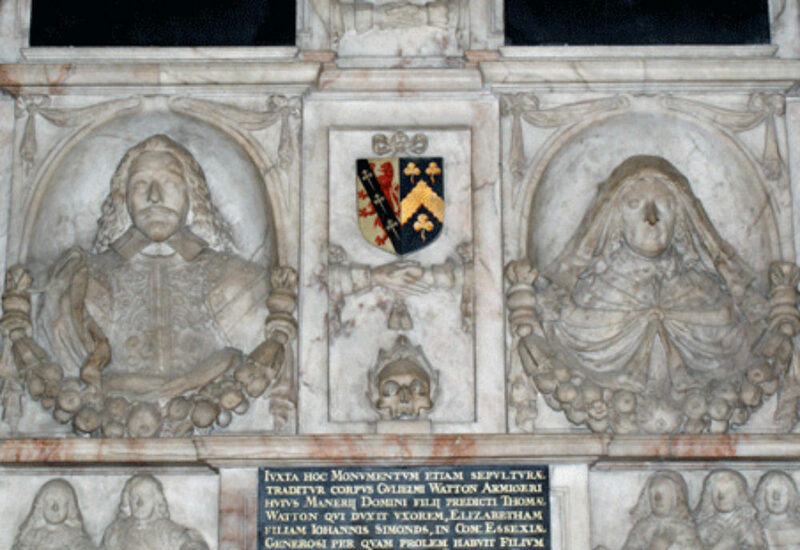 However, the style had been used at least as early as 1637 as seen on the monument commemorating William and Mary Platt at St Pancras Old Church attributed to Edward Marshall. The semi-naked reclining female figures on the outer curves of the segmental pediment are repeated on the documented monument to Sir Edmund Verney, his wife, son and daughter-in-law at Middle Claydon, Buchinghamshire erected in 1653 by Edward Marshall. The forward-facing wreathed skull is a feature seen on a number of known and attributed Marshall monuments. These include that to George Howe, 1647 at Berwick St Leonard Wiltshire and to Sir Henry Crispe 1651 at Birchington on Sea, Kent, both attributed to Joshua Marshall. 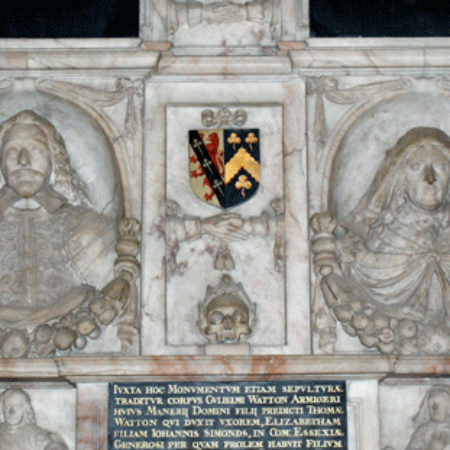 The symbol of the joined hands can also be seen above Sir Henry Crispe’s two wives. Near this place is buried the body of Edmund Watton of this place Esq. Who took to wife Elizabeth, daughter of Robert Arnold of Gillingham in the county of Kent esq, died in the month of September AD 1527.
charissimi mariti Hoc monumentum posuit. Near the monument is consigned to the grave the body of William Watton Esq, Lord of this Manor, son of the aforesaid Thomas Watton who led to wife Elizabeth daughter of John Simmonds in the county of Essex, gentleman by whom he had issue 1 son and three daughters, viz William, Elizabeth , Margaret and Anna Died October 28th AD 1651 His death deeply grieved his family and his most pious and affectionate spouse Elizabeth who in memory of her most beloved husband erected the monument. nitorum unica hæres parentes sola superstitit. Under this marble are also deposited the remains of Edmund Watton and Sarah his wife by whom were born 4 daughters, Elizabeth, Mary, Margaret and Anna – of whom Elizabeth out of so many relations and kindred was the only one and sole heiress who survived her parents. Elizabeth the heiress was twice married and died in 1775. The lettering on the two lower inscription panels, while imitating the main panels is clearly painted later, possibly in or after 1703. The Watton arms Argent, a lion rampant, gules, debruised with a bend, sable, charged with three cross-croslets fitchee argent, is much in evidence on the monument impaled with the arms of the various families into which they married. The Wattons had lived in the parish of Ridley since 1347 and the manor of Addington came into the Watton family when Alice Snette married William Watton in the early fifteenth century. He died in 1444 and was buried in the church.